Today I have a couple of polishes from the new Pretty Serious "In the Night" Collection. The whole collection is based on a 1990's Sega Saturn game called Nights into Dreams, and the fact that Kaz has based this collection from that retro game is totally geeky and awesome! The two polishes I have are named after the two children characters in the game, the girl Claris and the boy Elliot. I just love how she has gone with the classic pink and blue shades for the girl and boy. Claris - is a bit of a cross between and creme and a jelly finish, which I've seen referred to as a crelly. So that's what I'm going with. 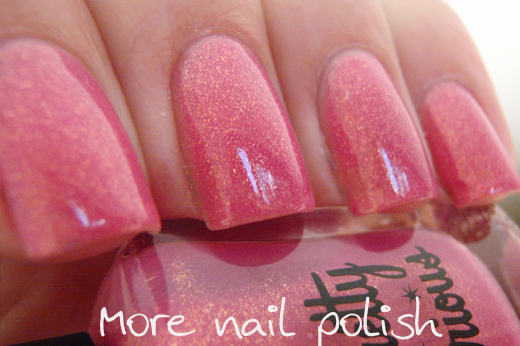 This pink crelly polish is packed with tiny gold flakes which give a really rich and strong shimmer. I'm not a huge lover of pink polishes, but the gold shimmer in this has totally won me over. This is three coats on its own. 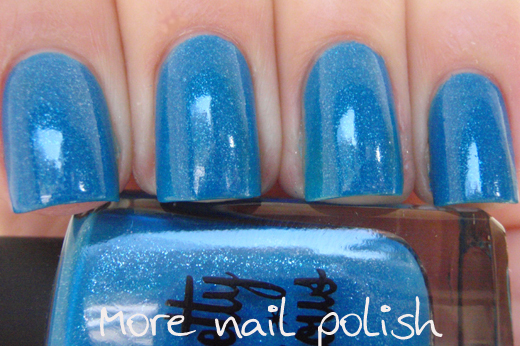 Elliot - is sky blue and packed with silver micro flakes. Elliot is more opaque and this is two coats. 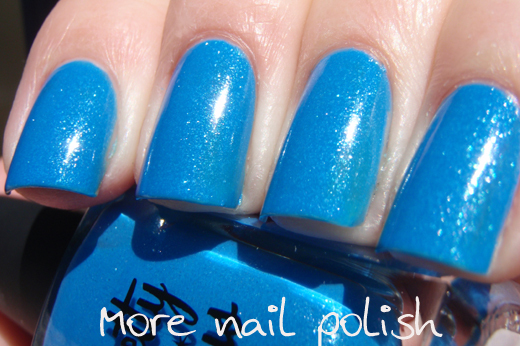 What I love about the shimmer in this one is that it makes you nails look like they are sparkling wet. Forbidden Fruit from the Pretty Random Hello World collection has this same look and I love it. I found the formula on both these polishes was really good, thick but smooth and the brush was easy to use and keep clean around my cuticles. They also dry to a very shiny glossy finish, and none of these pictures have top coat. You can get the Pretty Serious In The Night collection from pretty-serious.com. 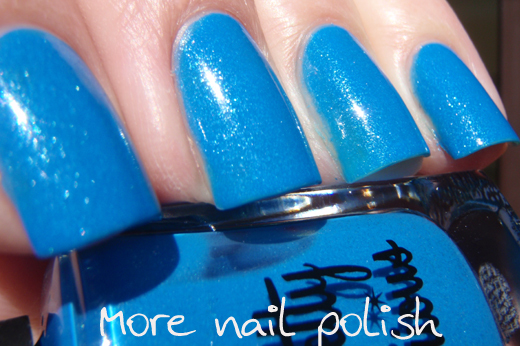 Polishes are $9.95 AUD and she does ship internationally. Polishes sent to me for review. Your pics of these two are perfect! :) i like them all!! i'd love to try both colors! I just love the shimmer and sparkle in these!! Super pretty! Claris is at the top of my shopping list! I want to make a crelly sandwich now with Claris and some fab glitter. That pink is super duper pretty! I just fell head over heels for Claris! Amazing!